But I’ve come to realize that some of the behavioral expectations we place on young children are simply not developmentally appropriate for many kids. For example, there may be some two-year-olds who can be counted on to not touch breakables on a low shelf, but most would find them irresistible. Often restrictions we give kids are for the parent’s convenience or whim and don’t really have much to do with health and welfare or developing virtues. Those are the areas where we parents tend to get into the biggest power struggles with our kids (can you tell I speak from experience?). Let me give a simple real life example. At midday on a recent weekend, our family had to get ready to attend our oldest son’s piano recital. We had been out playing in the yard, and we all needed to get cleaned up and change clothes. What’s more, we were on a tight timeline and we needed to iron clothes for some of us before we could get dressed. I started with my default approach, calling everyone in from the yard to all quickly get ready. We had prepared the kids by letting them know in advance that we were going to have to move in and get ready quickly. This worked fairly well for the 6 and 9 year-olds, though they were reluctant and it took some coaxing. But the 2 year old could not be convinced. He was on a digging project. He had no real interest in going to the recital (though once there, he sat very nicely and quite enjoyed it) and was already tired and ready for his nap. Based on the rigid models I grew up with, my default approach would be to throw up my hands and feel I had no choice but to disrupt his play and carry him in, causing what would undoubtedly have been a colossal melt down on his part. That of course would have made getting him ready nearly impossible as he screamed and refused to get dressed, which would have delayed us all the more, raising everyone’s stress and making everyone unhappy. Happily, I’m learning. I turned to tendersaplingmama for assistance. It wasn’t necessarily breezy in the stress of the moment, but she came up with a brilliant compromise. First, throw out any unnecessary expectations. My desire for everyone to go inside to get ready at the same time was not necessary. We could all take turns as long as we moved quickly, providing the two-year-old some extra time to finish his project in the dirt. But what about the ironing? Mama had an out-of-the-box solution to that, too. 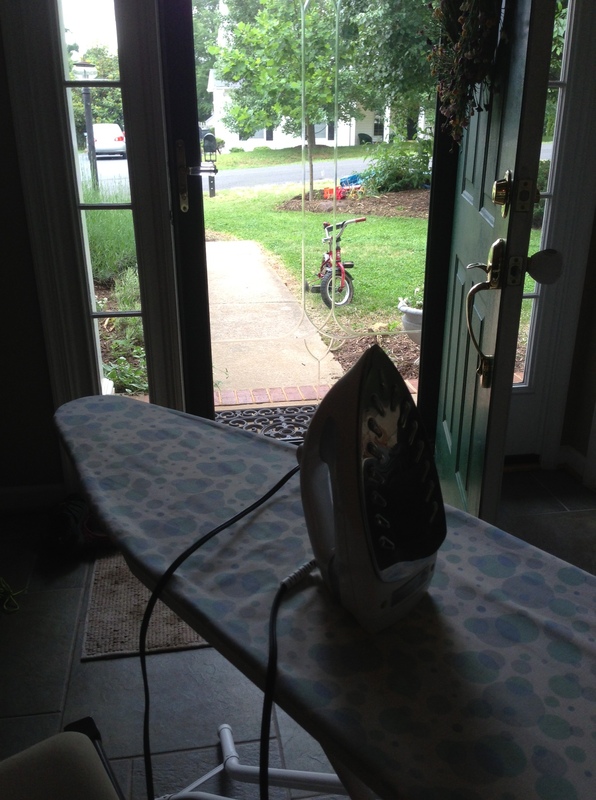 She set up the ironing board in the foyer so she could watch toddler in the front yard. My intuition tells me that this bending talent comes more naturally to mothers on the whole—women generally are gifted with qualities of the heart like patience, empathy, and flexibility—but many men are masters at this, and even those of us who start out from a rigid place can learn to use this technique to wonderful result. Bending is not always easy. It can mean more cleanup, or a little wasted food or art supplies here and there if the toddler is determined to make a soup using real food (as ours has been doing daily for the past few months). But remember it’s a terrific learning process for them. Tendersaplingmama and I like to remind each other that pricey Montessori prepared environments were conjured up to mimic a rich home environment, so we believe it’s all the better for kids to experience those things for real, at home. It may not be easy, but it can be a win-win for everyone. So next time you’re knocking your head against a wall trying to get a child to cooperate, first reflect on whether bending in the wind might help. Maybe that means changing the environment, your attitude, or the rule. Maybe it just means doing a little ironing in the foyer while the toddler digs in the front yard.